Ultrasonic Impact Treatment (UIT), Ultrasonic Impact Peening (UIP), Ultrasonic Hammer Peening, Ultrasonic Needle Peening (UNP), Ultrasonic Peening (UP), and High-Frequency Mechanical Impact (HFMI) processes can be used to describe the same technology using high power ultrasonic systems to make surface impact peening treatments. Ultrasonic Impact Peening is a cold working process that uses high-frequency and high-velocity impact of a hard metal tool tip to plastically deform a material in order to introduce beneficial compressive residual stresses. These residual compressive stresses are produced by work hardening with the intent to replace residual tensile stresses in metal surfaces and welded joints. 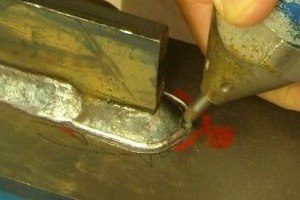 In weld joints, one significant objective is to improve the fatigue strength of welds that may be subject to dynamic stress conditions and susceptible to stress cracking. The ultrasonic impact peening system includes an ultrasonic generator power supply connected by a cable hose to the tool housing that contains an ultrasonic transducer assembly and the impact pin(s). The tool housing tip holding the impact pin(s) is replaceable and can be designed in a wide range of options to allow for one or many pins in various arrangements to address many different applications. The tool housing can be optioned for hand-held operation or mounting to a robotic arm for automated applications. The Aktive Arc ultrasonics design team can provide custom pins and pin holders for most any application. We offer standard tool designs working at 20 kHz and 35 kHz. Other custom frequency system are available on demand. enhance low and high cycle fatigue and has been documented to provide increases up to ten times greater than non-treated ultrasonically peened specimens. Why is Ultrasonic Impact Peening better than conventional Air Hammer Peening Tools? Ultrasonic Impact Peening requires only moderate pressure applied by the operator to the work piece and will provide a uniform treatment that is critical to the process finish. Air Peening Hammers require strong pressure applied to the base metal side in order to minimize deviations due to vibration. Conventional Air Hammer Peening is relatively slow and efficient work is not possible. Ultrasonic Impact Peening can be two to four times faster with significantly improved results. Because Ultrasonic Impact Peening tools produce significantly less vibration and noise the work environment is more comfortable and allows for extended work periods. Air Hammer Peening tools create significant noise and vibration to the operator hand and arm thereby limiting the daily working time. Ultrasonic Impact Peening (UIP, UIT, UP, UNP, HFMI) is typically a post-weld treatment that uses a high power ultrasonic hammer to treat the weld and is most commonly focused along the weld toe. The mechanism is similar to hammer peening however ultrasonically activated peening tools offer an improved, more consistent, and faster treatment. Weld toe treatment speed is typically in the range of 30-60 cm/min (1 – 2 ft. /min). Ultrasonic Impact Treatment of the weld toe, the transition area between the weld and base metal, produces a smoothed radius that reduces the local stress concentration. The depth of the radius should be in the range of 0.5 – 0.7 mm. Due to the deformations produced in Ultrasonic Peening shallow surface cracks in welds are easily repaired. When done properly the process offers significantly improved fatigue strength. Weld joints on offshore rigs are subject to constant stress and strain due to rough sea conditions. The same is true for Floating Storage and Offloading (FSO) vessels that are additionally subjected to the stresses of the cyclical loading, especially in fatigue prone areas. As the rig and vessel welds approach the end of their known fatigue life our clients are faced with the challenge of repairing and maintaining failing weld joints. Normal repairs to these high stress joints are often temporary and not sufficient for long term operation. By using our Ultrasonic Peening technology to dress repaired welds and also treat undamaged welds in high stress areas our clients can reset the fatigue life and add up to fifteen years of additional service life. Ultrasonic peening can be the best option for fatigue life improvement of FSO & FPSO welds in high stress areas. 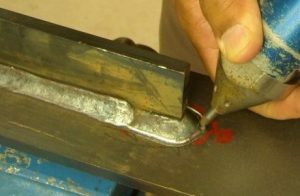 The Ultrasonic peening technique involves the cold working of the weld toe and weld face and can improve the fatigue strength of full penetration weld configurations by up to four times. Welds identified at particular points of structural integrity are targeted for Ultrasonic Peening treatment. The fatigue life extension of those specific welds will offer a general life extension of the offshore structure or vessel. This type of treatment is currently used to avoid or prevent fatigue cracks in high stressed weld connections in offshore structures. If required our service partners can be contracted to perform this type of ultrasonic peening treatment in almost any offshore environment, confined or not, with or without rope access. Ultrasonic Peening treatment can often be used in any accessible area where relatively high stresses are present. The ultrasonic peening treatment will significantly help prevent fatigue cracks during the remaining service life of the installation. The treatment is so effective that it could extend the service life of any full penetration weld configuration by at least four times. 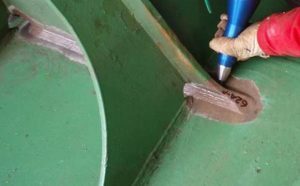 Treatment can, for example, be carried out as a preventative or maintenance measure during a scheduled tank inspection thereby providing an easy way to avoid the onset of fatigue cracks in areas with difficult access such as inside cargo tanks. 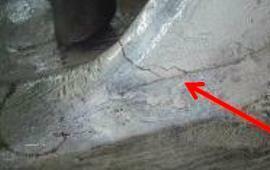 As the treatment targets only areas of high risk for fatigue cracks to develop it is relative quick work and can be done in approximately the same time as it takes for the inspection work to be finished. Our ultrasonic peening technology gives offshore operators a pro-active solution for fatigue related structural integrity challenges. By using ultrasonic peening the rig manager or the structural integrity engineer will be able to eliminate frequent shutdowns for structural repairs. Ultrasonic Peening saves time and money – Preventative treatment or proper post weld repair treatment will protect future uptime and result in significant time and money savings. A typical offshore ultrasonic peening team consists of two ultrasonic technicians, an NDT inspector, and a QA & QC Engineer depending of the location to be treated and the accessibility. 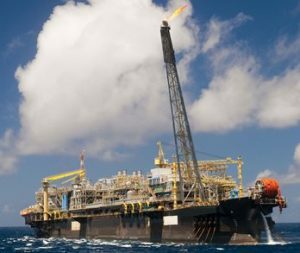 Through our service partners our equipment is active in the world’s biggest offshore regions including the North-Sea, Gulf of Mexico and Brazil. Both land based and offshore wind turbine towers are subject to cyclical loading caused by gusting winds and rotor vibrations. Floating offshore towers are additional subject to sea waves. These conditions create high stress conditions for tower structure welds that require special consideration and solutions to enhance weld joint fatigue strength. While some conventional solutions offer a bit of added fatigue strength none offer the proven and superior results achieved by Ultrasonic Impact Peening. UIP offers rapid and efficient weld toe reshaping that seals surface cracks, makes metal gain refinement, improves residual stress and gives significant fatigue strength improvement. By targeting weld joints in high stress areas Ultrasonic Impact Peening can double the fatigue strength offering significant life extension of tower structures. Railway structures, as with all welded structures, are designed with a limited life span that is highly dependent on the fatigue strength of welds that are subject to dynamic stress conditions. In many cases that life span may be significantly reduced because the original structure designs were based on short sighted requirements that underestimated the number of train rail cars used and the frequency of use. Due to normal aging and the added stresses compounded by the added train weight and frequency of use many railway structures have prematurely reached or are approaching their end of life. Ultrasonic Impact Peening is known solution for life extension of welded structures. It can stop crack propagation from the weld toe and slow propagation from the root as it passes through the treated toe zone. A railway structure may be inspected for cracking and treated by UIP while under live load conditions. 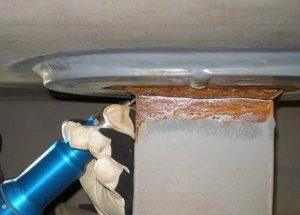 Identified critical weld areas may be treated with UIP as a preventative measure to reset and make life extension of the welds. UIP offers significant cost savings over other conventional solutions by eliminating the cost of added materials and providing a rapid treatment solution. 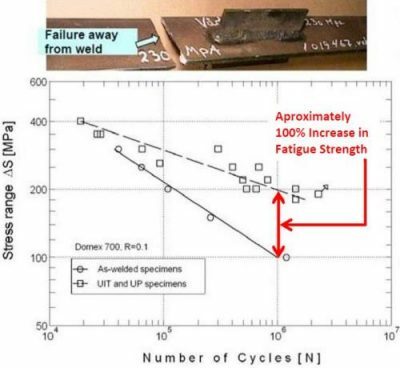 UIP will significantly improve the performance of welds and extend the fatigue life. Ultrasonic Impact Peening may be adapted for use in tool & die polishing and surface hardening. UIP provides plastic deformation via the tool tip repetitive impacts and can offer many beneficial effects on the surface layers of various metallic materials. Effects include changes to the surface nanocrystalline structure, surface compressive residual stresses, work hardening of the surface, and surface deformation smoothing. The Aktive Arc design team can adapt our technology to your robotic application and design tips to your requirements. 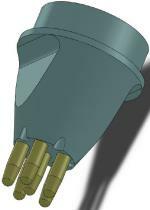 We can offer custom tip shapes, modify the impact force, and provide a range of multi-pin tips.